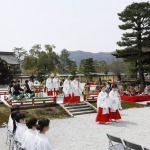 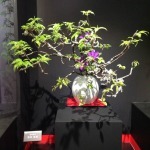 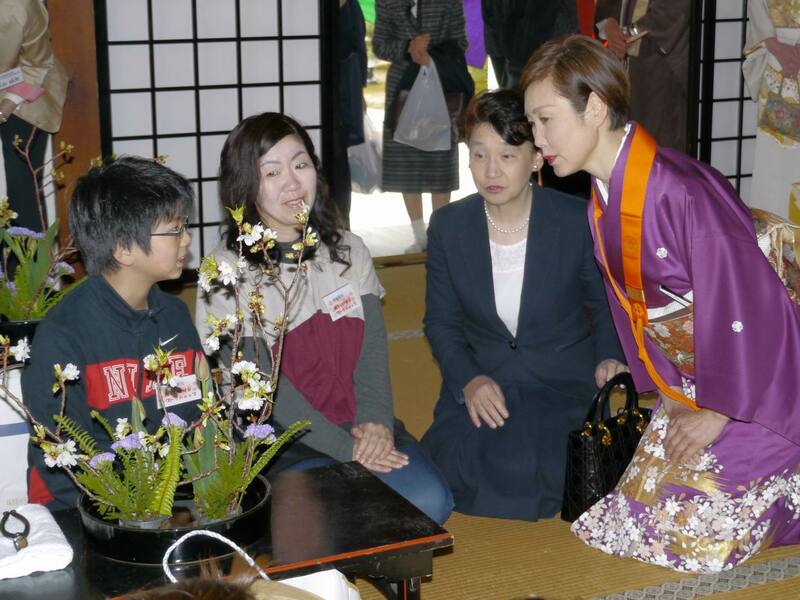 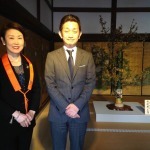 On the day that was blessed with fine weather, the Flower Arrangement Festival “Flower Memorial Dedicated to Emperor Saga” was held with the flower offering ceremony performed by the “Tan-en branch” of the Kyoto Northern district. 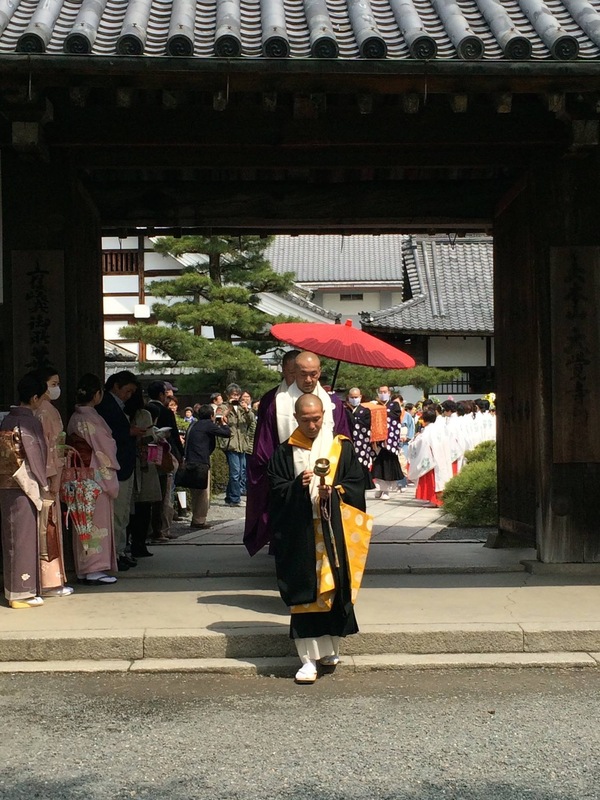 At 10:30 a.m., the long procession of priests and flower dedicators departed from the entrance gate and made the first flower offering at the Hanakuyouto Flower Memorial. 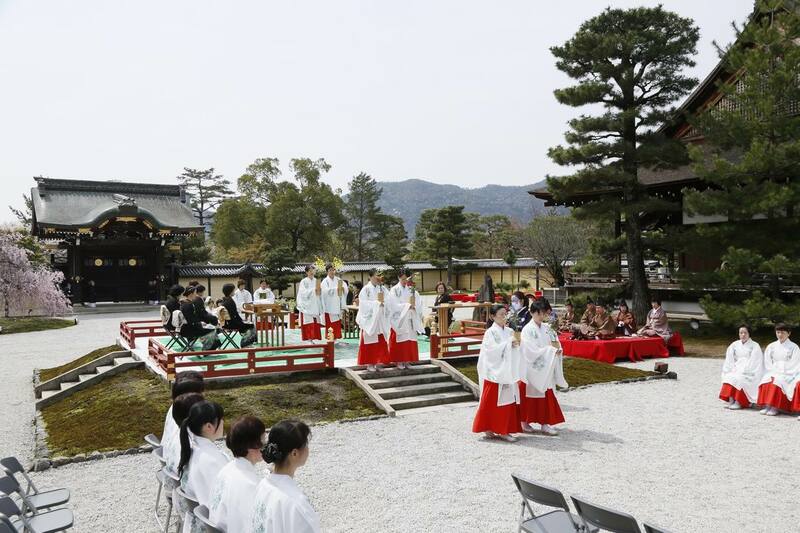 As many people watched over, the procession progressed through the Chokushimon Gate to the stone stage, greeted by the Japanese court music performance. 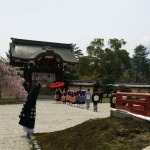 Once the procession reached the stone stage, the music ceased. 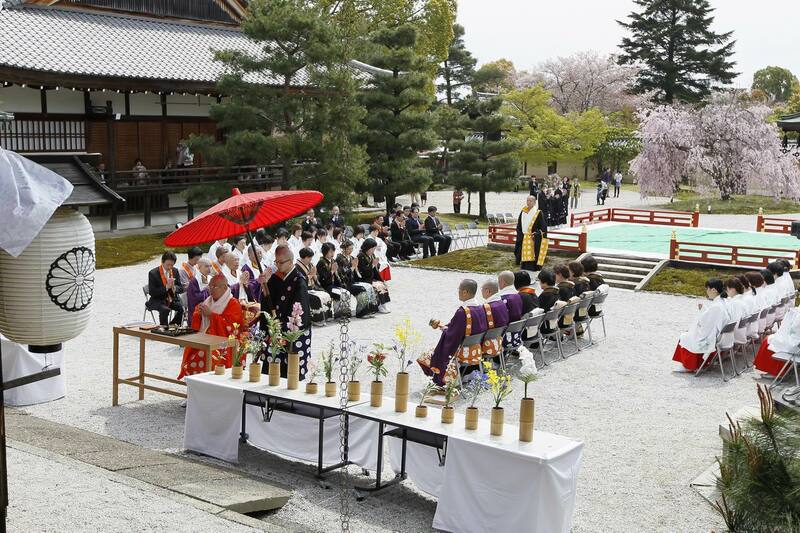 In the complete silence, the offering of the flower memorial handwritten sutra was performed, followed by the sound of a bell made by a priest to commence the flower offering ceremony. 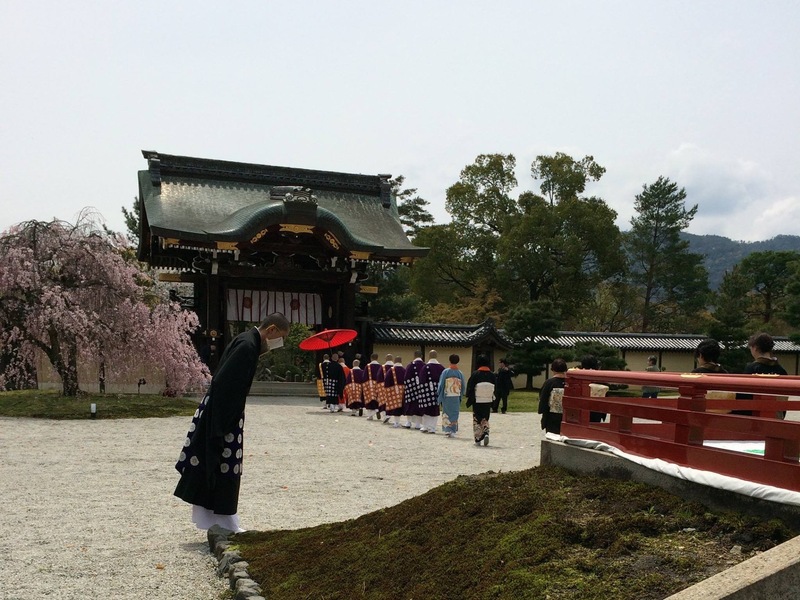 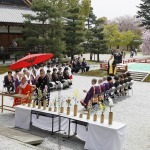 The 30 flower offering attendants dressed in the former attire, Chihaya, made offerings of small flowers in front of the hall. 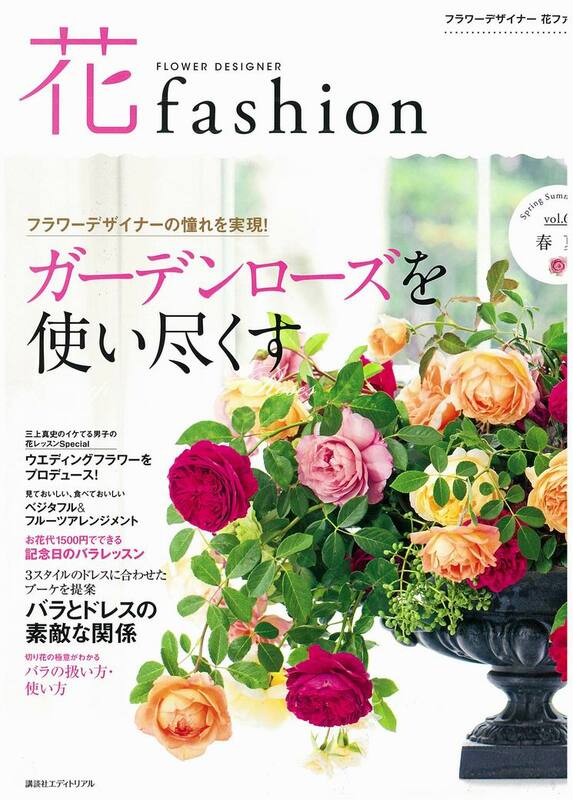 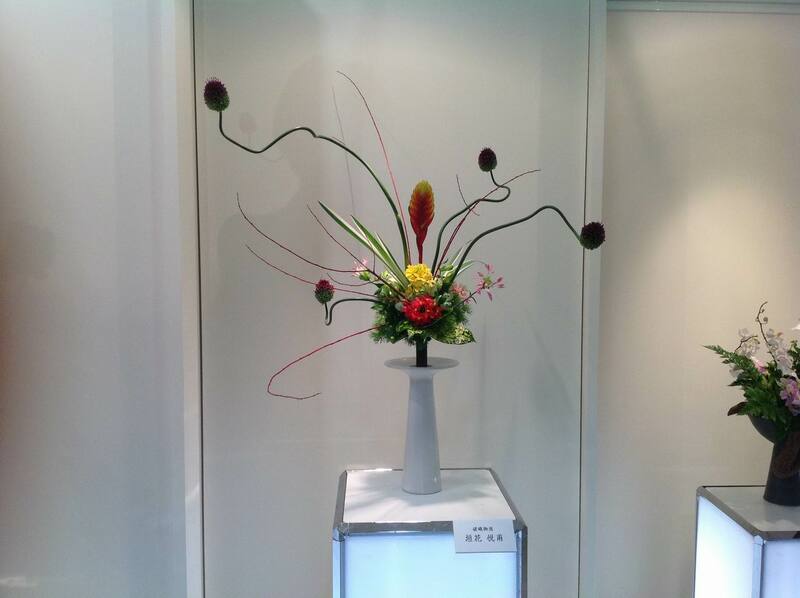 And then at the sound of shaku, the flower dedicators faced each other and began to arrange the set of flowers. 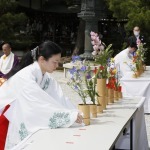 Flower dedicators, assistants and attendants were all positioned in pairs to perform in synchronicity. 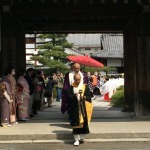 The moments were filled with solemnity as we viewed the movements in complete unison. 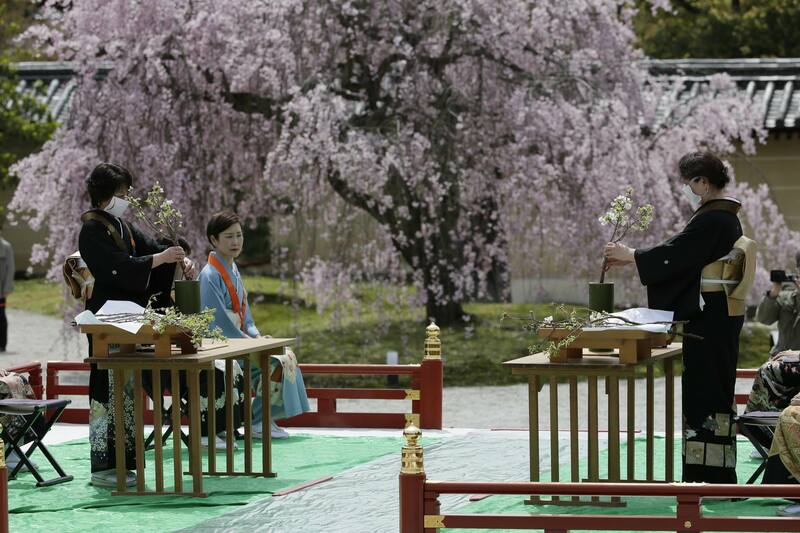 As the flower dedicators held the completed arrangement of cherry blossoms, the hearts of all ceremony attendants joined together naturally. 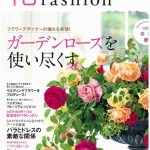 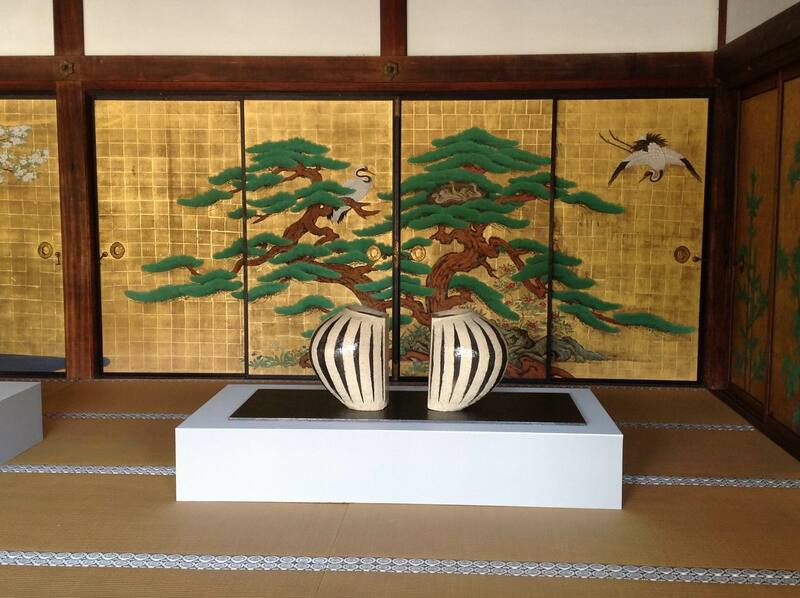 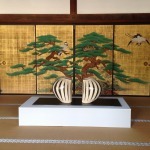 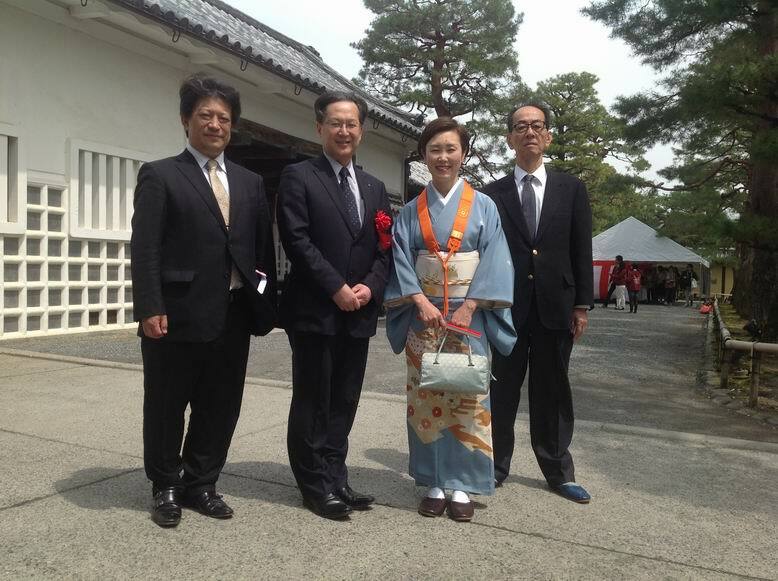 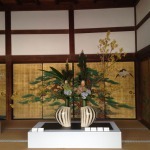 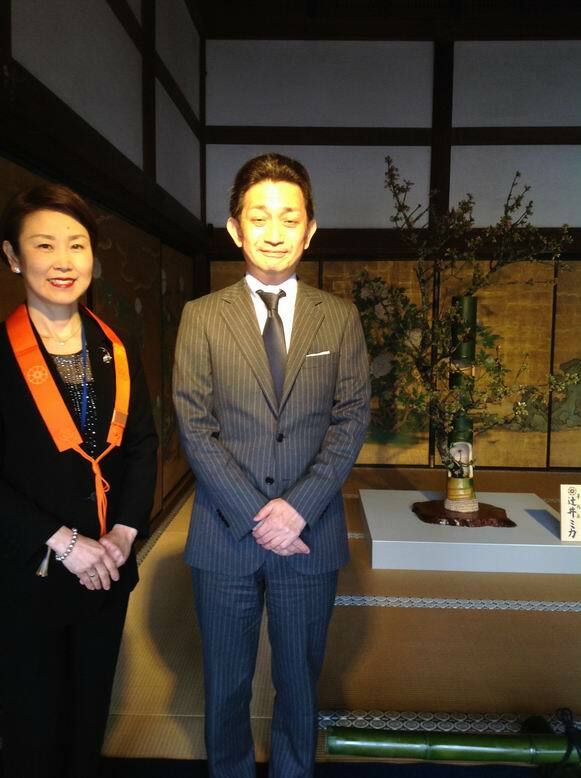 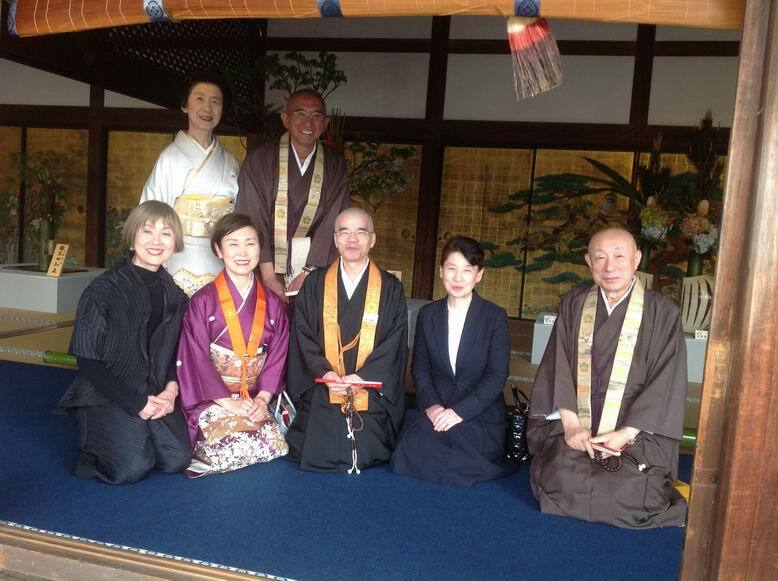 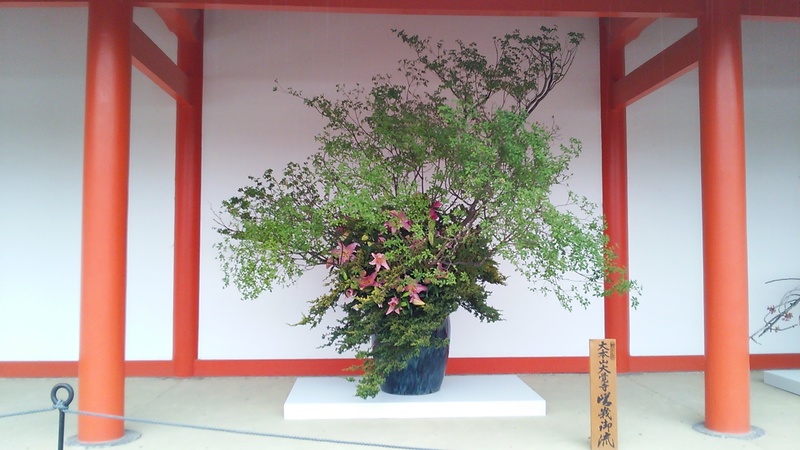 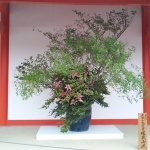 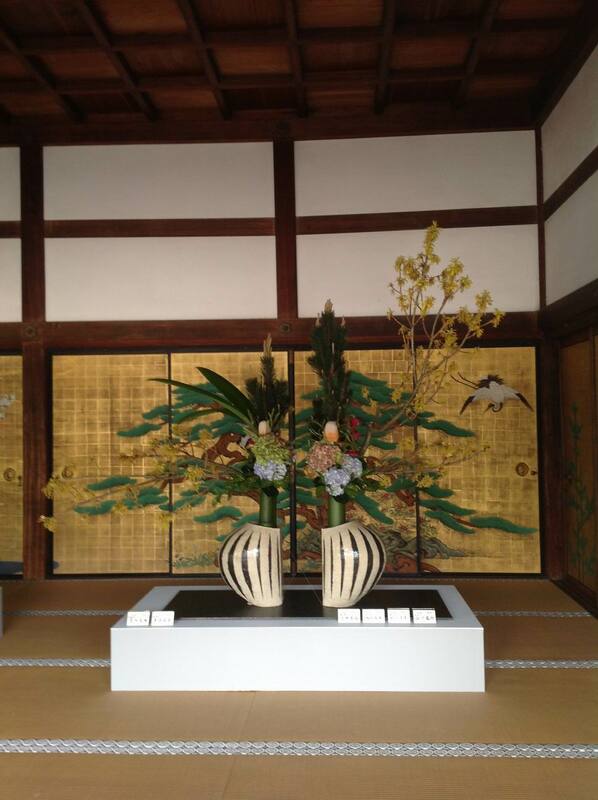 The flower offering was placed inside of the Shingyo den Hall, followed by the tea offering made by the “Teiko-kai”. 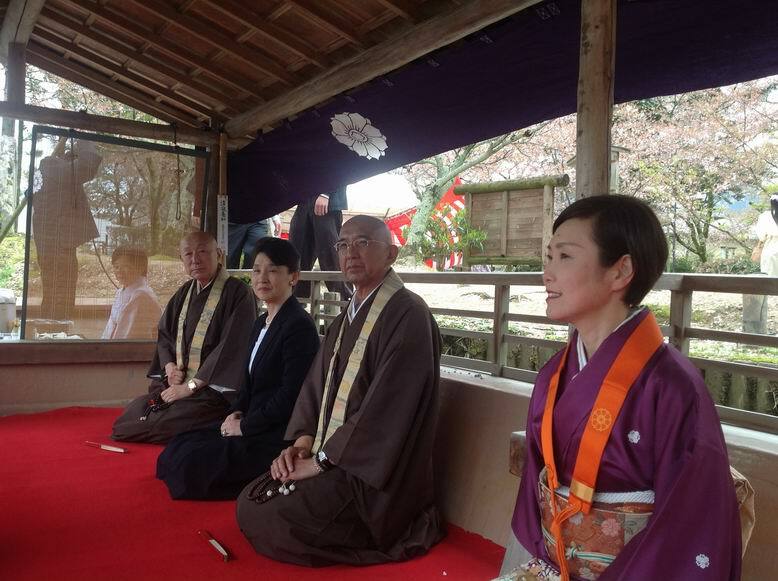 And then the sutra recitation was performed, followed by the Japanese court music performance by the “Miyabi –kogakkai”. 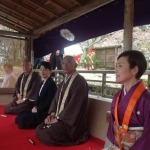 The memorial was performed in a solemn manner for 1 hour and a half. 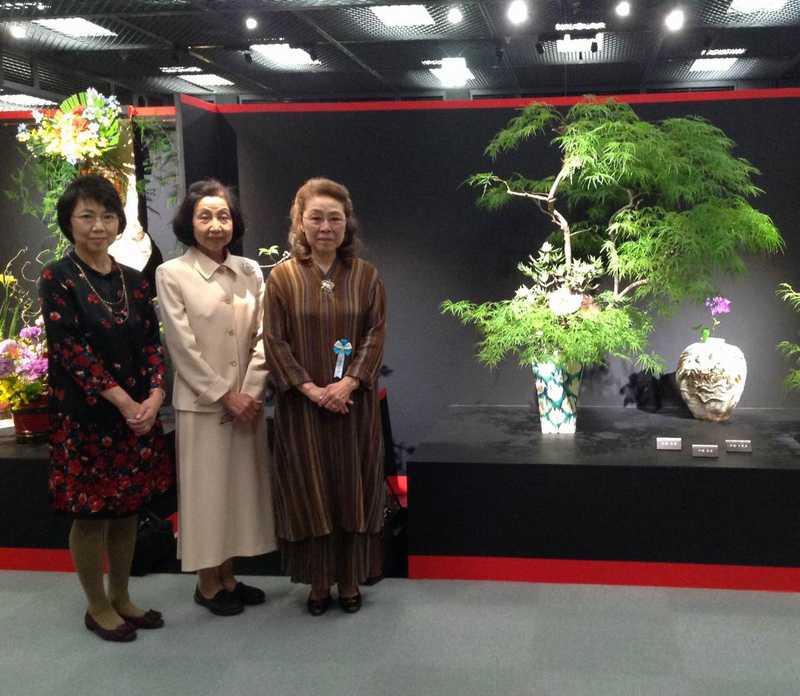 It was our great honor to have an honorable attendance of the Deputy Mayor of the City of Kyoto, Mr. Hiroyuki Fujita as well as the visit to the flower exhibition halls. 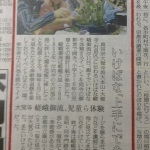 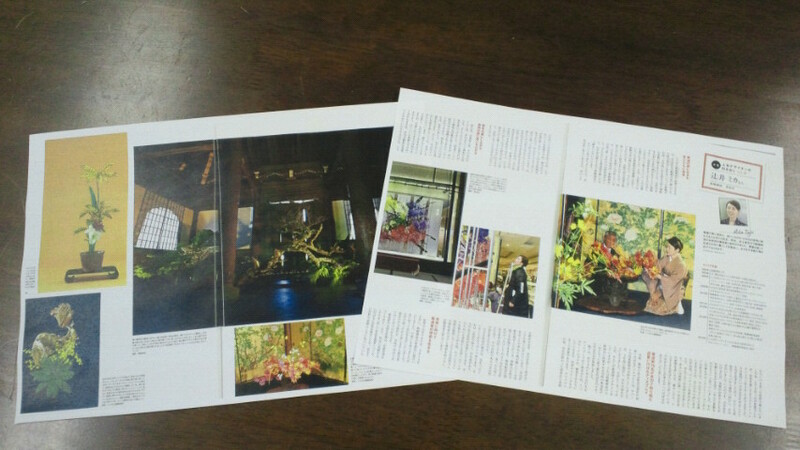 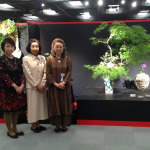 In the photograph with the Deputy Mayor are Mr. Kougetsu Hattori, the head of the Planning Division, and Mr. Chishu Murashima who guided the flower exhibition. 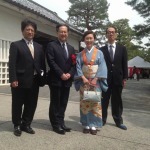 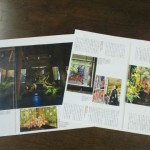 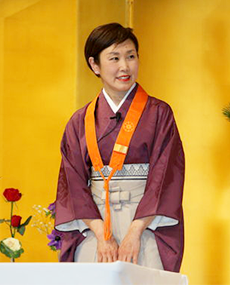 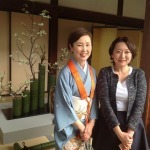 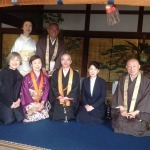 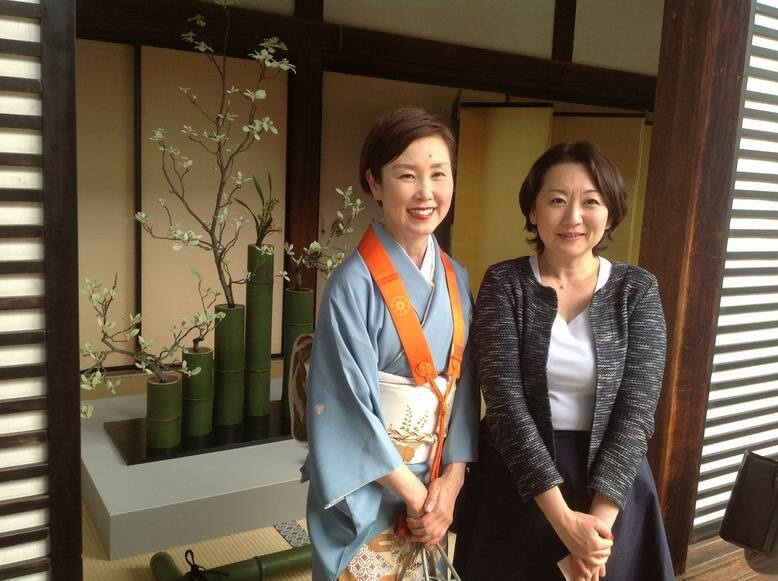 In the other photograph is the headmistress Kozan Okada of the Kozan School from Tokyo. 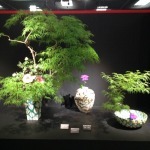 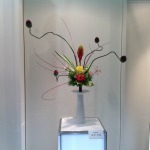 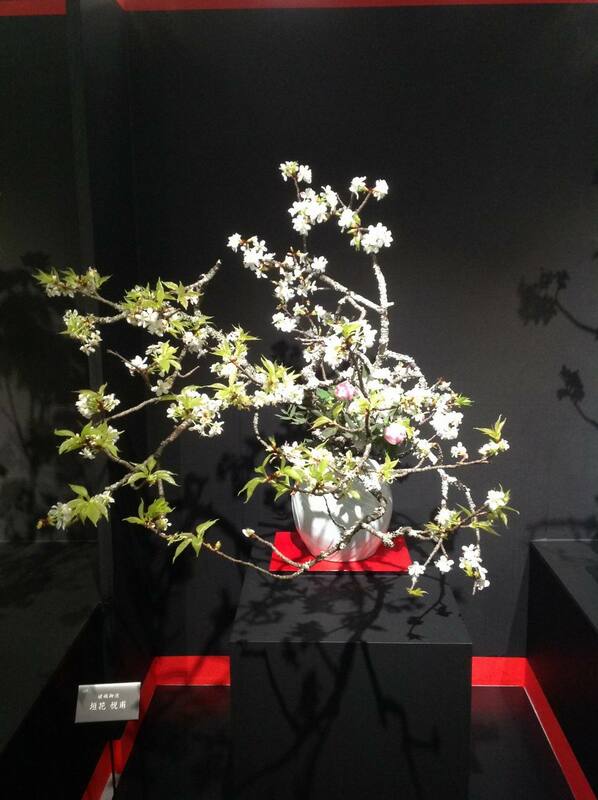 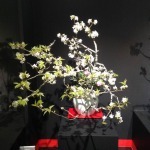 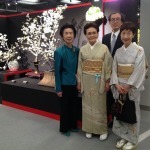 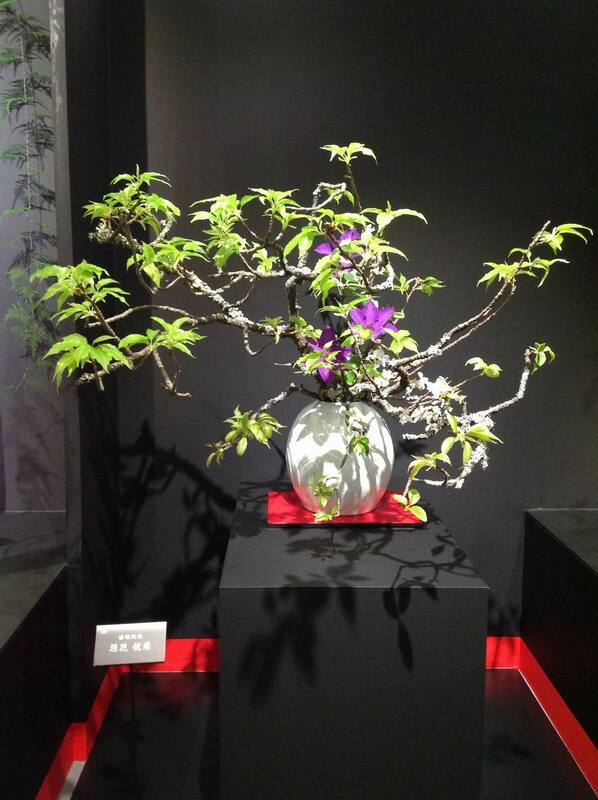 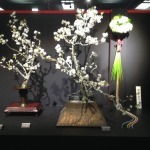 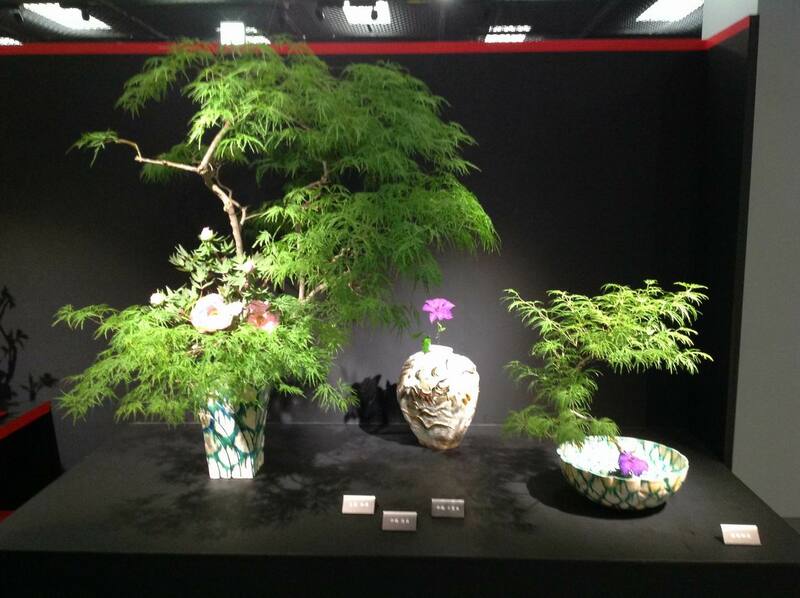 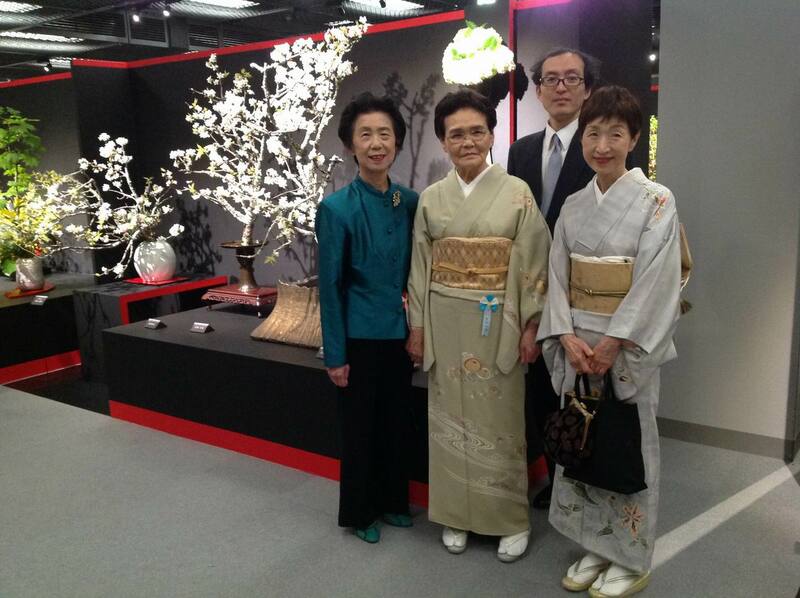 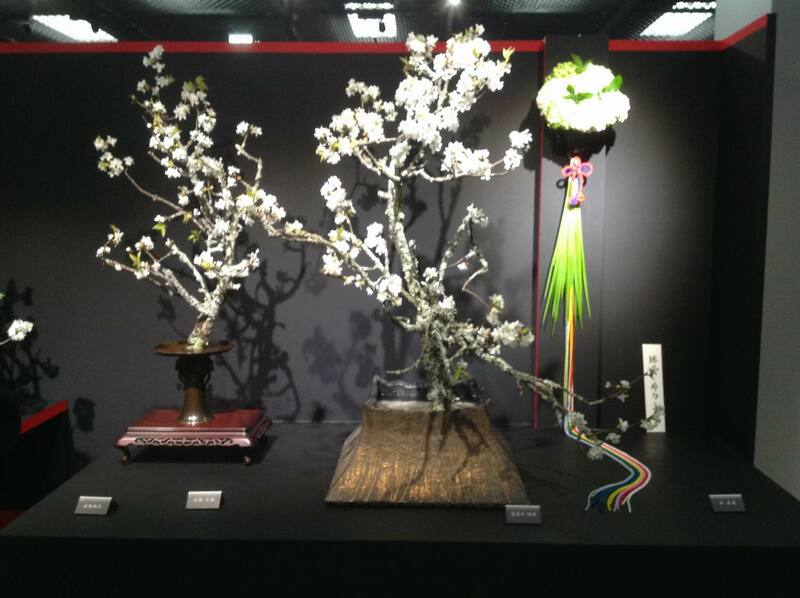 The flower exhibition had participation from our 109 nationwide branches and 20-plus overseas branches; the tea service was performed by the Teiko-kai; cooperation from the purveyors; the Headquarters professors, instructors, and the temple employees; more than 200 people functioned as staff to provide support throughout the 2 days of preparation and the 3 days of the event. 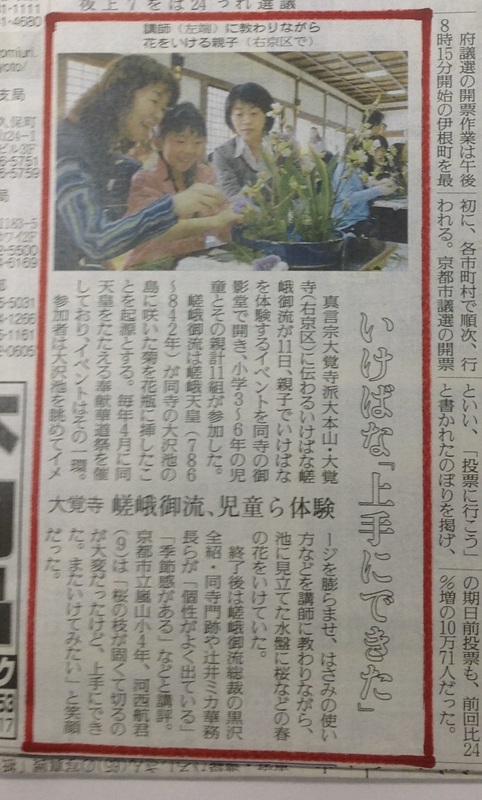 I extend my heartful gratitude to everyone who came to the event. 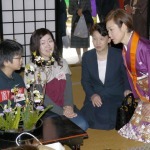 At the same time, I deeply apologize to those of you whom I was not able to greet in person. 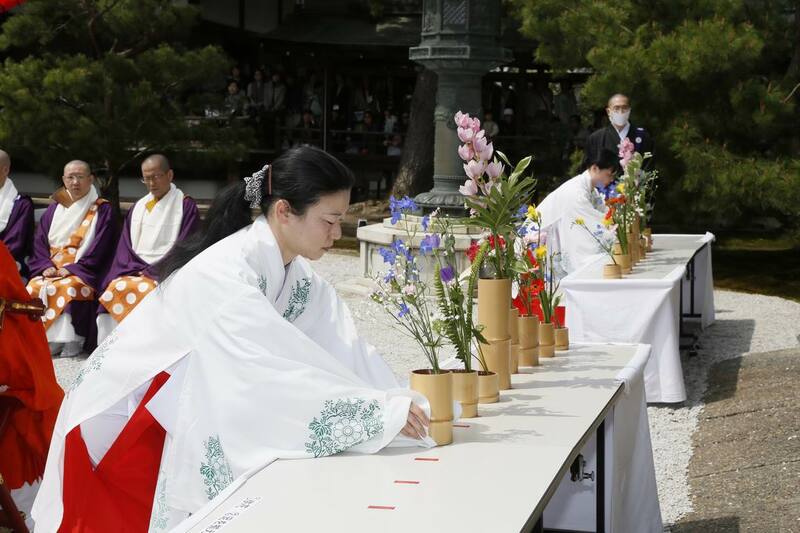 With support from everyone, the 3 days of the memorial flower festival dedicated to the founder, Emperor Saga was held successfully in peace once again this year.